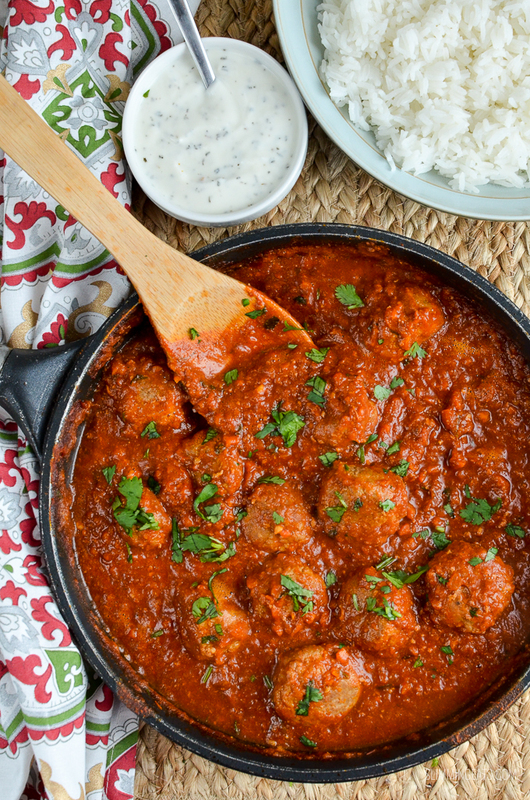 Delicious Tender Lamb Meatballs with a Spicy Tomato Sauce – a little bit of sweet with a slightly spicy kick. Lamb is a favourite of mine, whether it’s a roasted leg of lamb, a lamb curry, or some ground lamb in Shepherd’s Pie. There is just no denying the amazing flavour it can add to a dish. I have to admit though, ground lamb I don’t tend to have very often, as it is near impossible to get extra lean ground lamb that is syn free unless you have one of these handy meat grinders and a KitchenAid mixer to go along with it. Then you could have a go at making your own with a lean cut of lamb, where you can remove any visible fat. I do have the KitchenAid but have never gotten around to getting the meat grinder attachment for it, something I really should do. Maybe I might be tempted after reminding myself tonight. Although I think the sausage maker attachment appeals to me more, can you imagine being able to make your own syn free sausages? Now there is a thought. Anyway despite lamb or ground lamb should I say, pretty much always having a small syn value, most tend to avoid it. However, if you cleverly bulk the dish out with lots of sauce and veggies, you don’t need to use as much of it, and the syn value is not too bad then once divided into portions. Of course, depending on where you buy the ground lamb from, it will vary in syns. Here in Canada, it tends to be around ? syn per 100g. 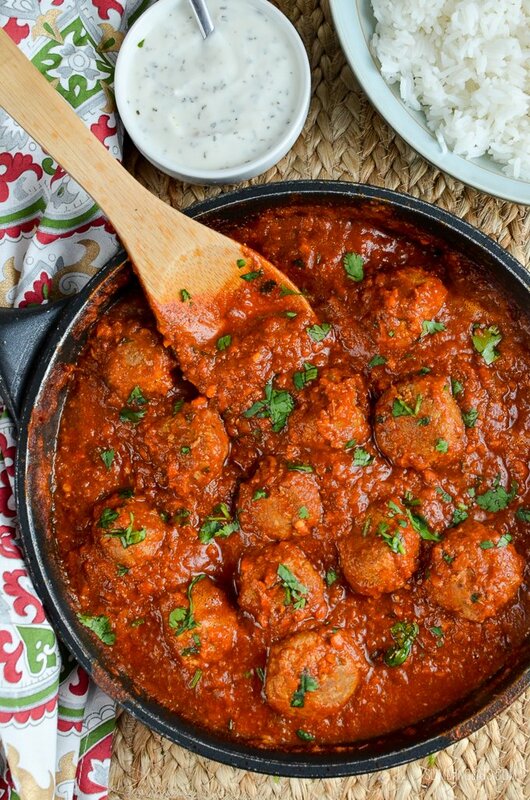 To make the meatballs in this Lamb Meatballs with a Spicy Tomato Sauce – it is really easy and basic ingredients. Just the ground lamb, fresh coriander, a red chilli, salt and egg, that’s it, no complicated ingredients. The sauce that follows is pretty easy as far as ingredient’s go, most are ones that you will have in the store cupboard. One thing I like to recommend when starting out any healthy eating journey is to build up a good spice and herb collection. You don’t need to go crazy, just buy 1 or 2 a week with your groceries until you have the basic selection, then you can just add to it, as a new spice appears in a recipe that you haven’t yet bought. Those spices will be your saviour for making meals taste amazing. There is nothing worse than bland and boring food. Remember as this is a life long journey, you need to make your food interesting and spices will do that to even the basic of dishes. 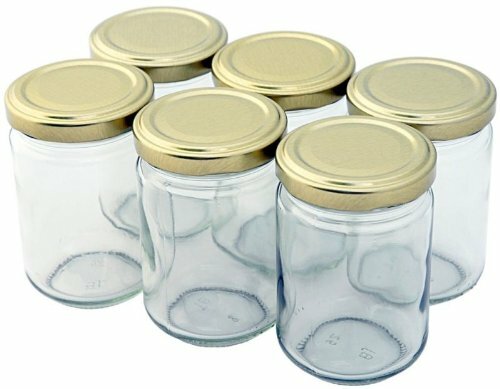 I like to keep my spices in plain jars like these 156ml Nutley’s Jars which you can get on Amazon in packs of 6, 12, 24 and even 48. As they are slightly bigger than your standard spice jar, they are better for storing larger quantities of spices. I don’t know about you, but I hate the little spice jars you get at most supermarkets, and many are overpriced. If you want to save money, try buying in bulk from local Indian grocers or similar, you can also buy from bulk spices on Amazon. Works out much cheaper all around. Then I love these little chalkboard labels, which you can stick on the jars and write the name of the spice onto the label. 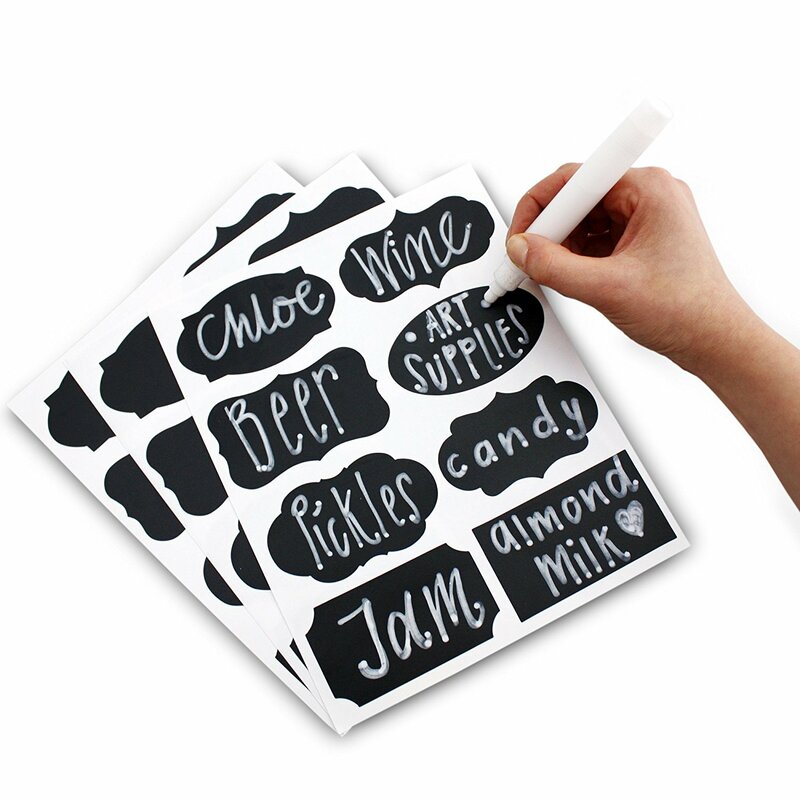 I prefer ones with a chalkboard pen, as it doesn’t smudge off as easily as just plain white chalk. A perfect storage solution for all your spices and they look quite neat and pretty too with the labels. I am a sucker for pretty things. For the vegetables in the sauce, I must admit to sometimes being a bit lazy, and using my Nutri Ninja Food Processor with Auto IQ technology. 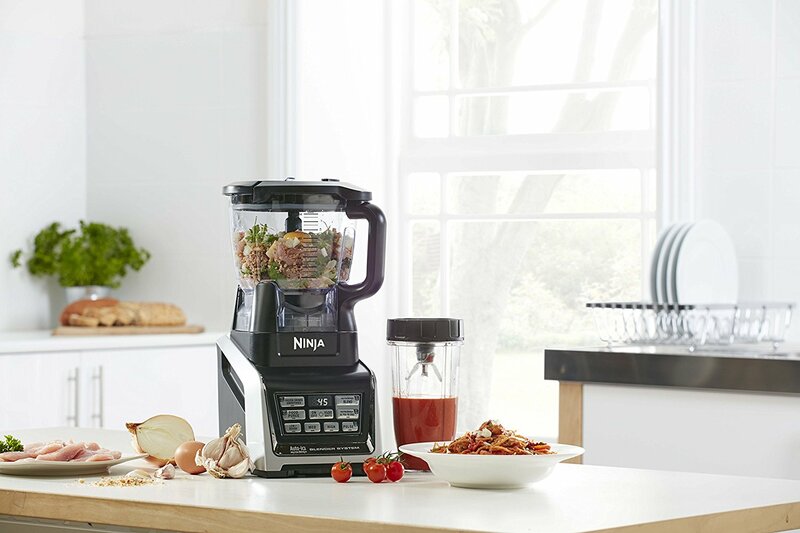 It literally chops all the vegetables up in seconds, saving heaps of time. I use the chopping blade, just a couple of pulses of the blade and the vegetables are chopped finely – perfect!! If I can save a little bit of time cooking when I know the kids will be hungry and demanding food pretty soon, then I am taking those short cut believe me. 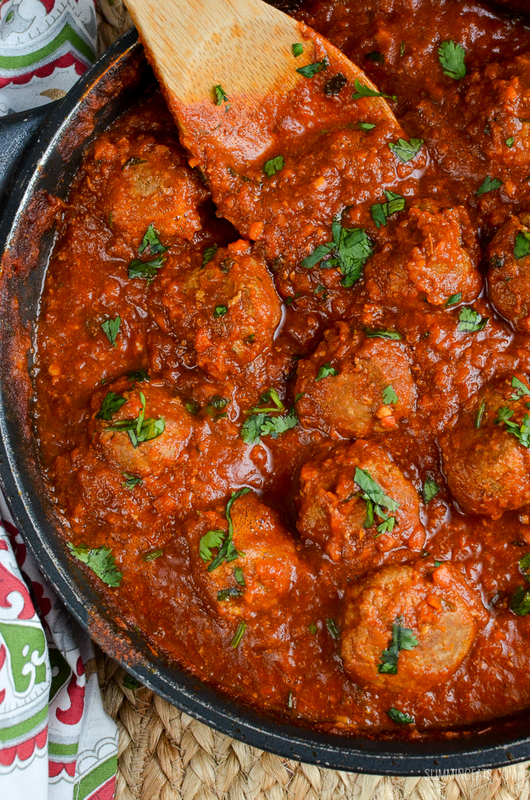 The sauce to these Lamb Meatballs with a Spicy Tomato Sauce is literally spoon worthy. I could literally eat that sauce in a bowl on its own, only trouble is, I would probably want lots of naan bread to go along with it. Which isn’t going to save my syns for that bit of chocolate I might want later. If you really can’t do without the bread, you could always have a go at this Sweet Potato Flatbread. It’s gluten and dairy free and rather yummy. I often have a couple made in advance and in the freezer, so they are on hand when I might need one quickly. 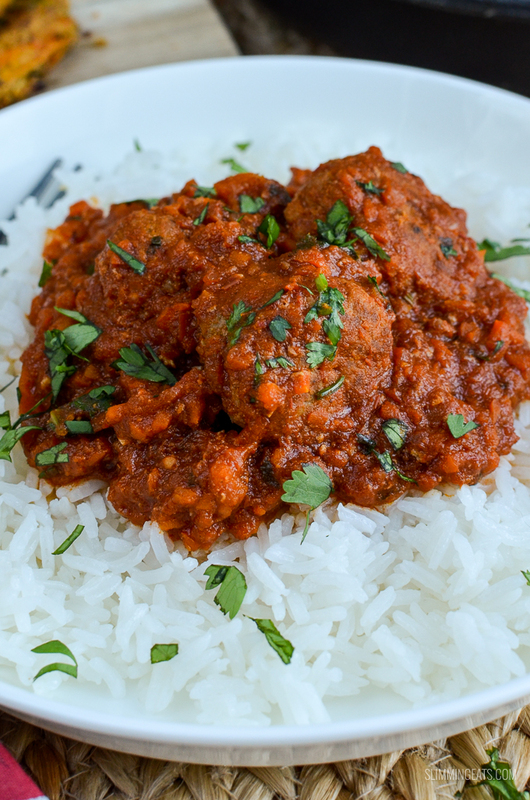 For tonight though, I just fancied some good ole steamed jasmine rice to go with these Lamb Meatballs with a Spicy Tomato Sauce. You don’t need to stick to just rice though, these would pair up nicely with a variety of sides including these Perfect Syn Free Chips and if you are lucky enough to have any leftovers, you will be pleased to know, it freezes perfectly. 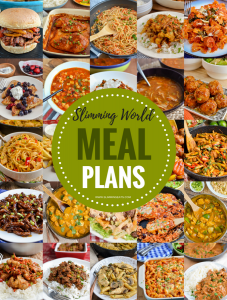 and don’t forget my FULL RECIPE INDEX with over 500+ Delicious Slimming World Recipes. 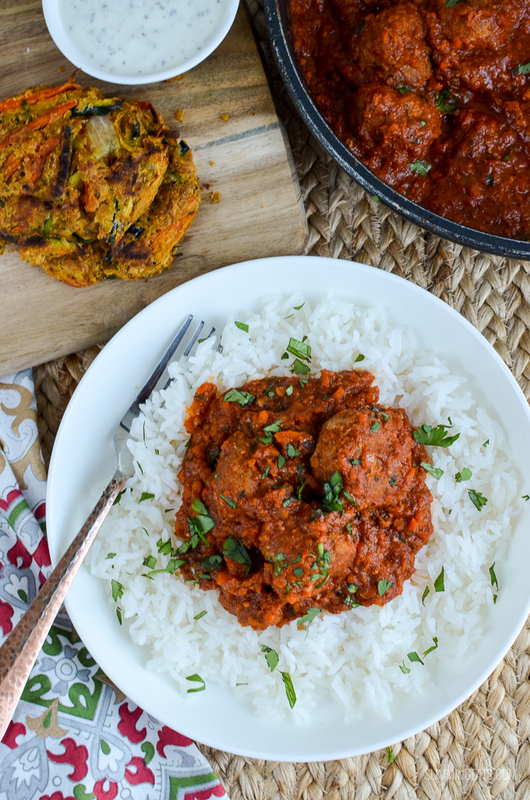 Sprinkle these Lamb Meatballs with a Spicy Tomato Sauce with some freshly chopped coriander, and serve with a side of syn free onion bhaji and a drizzle of mint yoghurt (plain yoghurt, fresh mint, lemon juice and a little sweetener). If doing an SP day or are following a paleo diet, try serving with this Roasted Cauliflower Rice. 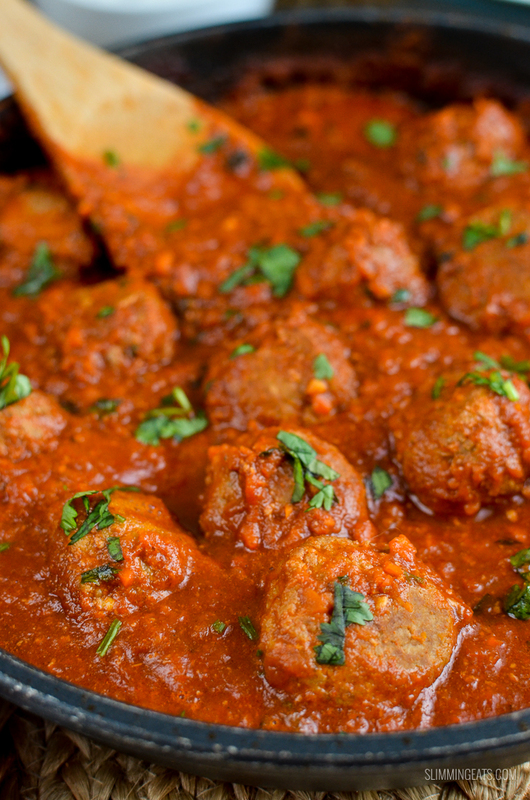 Made this Lamb Meatballs with a Spicy Tomato Sauce? 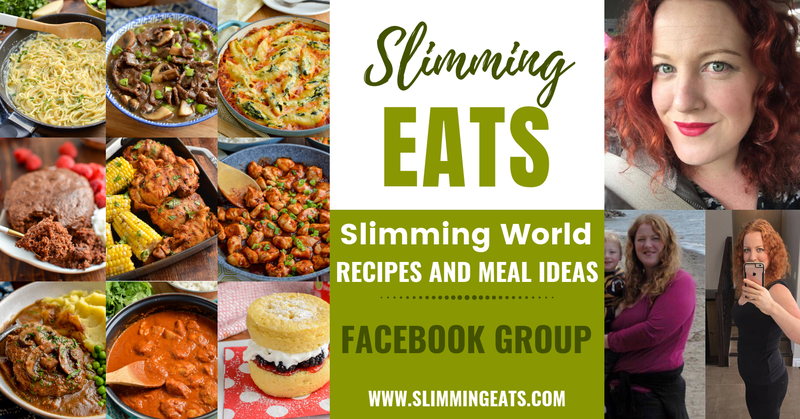 Tag me at #slimmingeats on Facebook, Twitter or Instagram so I can see your pictures. In a large bowl, add the lamb mince, a few tablespoons of freshly chopped coriander, 1 finely chopped red chilli, 1 clove of garlic, some freshly grated ginger, salt, pepper and 1 egg and bind it all together well. Form into equal sized meatballs. Spray a frying pan with some spray oil, and brown the meatballs. Then set aside. Add the onion, garlic, some ginger, and the carrot to the frying pan and cook for 2-3 mins until softened. Add the passata, tomato paste, stock, all the spices, and sukrin:1 (sweetener) and bring to the boil, reduce heat and simmer for 20 minutes. Add the back in the meatballs and continue to simmer for an additional 20 minutes. Ingredients can vary greatly from brand to brand and therefore it would be impossible to give accurate information. Also, double check syn values of synned ingredients as different brands can vary. This looks DIVINE!! Cant’ wait to try it tonight!!! I made these tonight, they were delicious! I wasn’t sure, as I had beef mince, rather than lamb. Plus I didn’ have fresh ginger and coriander – but I used the dried variety and it still worked. I like your variation. Glad you enjoyed it 🙂 – Hope you are doing okay? thanks for commenting. I am glad you enjoyed them. It is definately one of my favorite recipes. Hubby is not keen on rice so he had it with SW chips instead and loved it. I made these last night and they were really tasty. Like some of the others, I used beef mince instead of lamb but only because hubby doesn’t like lamb! Would I be correct in supposing that mine were syn free as I used granulated sweetner instead of ordinary sugar (diabetic). good to hear you enjoyed it and it worked well with beef too. Yes you are right, it would be syn free when using sweetener instead of sugar. Wow! 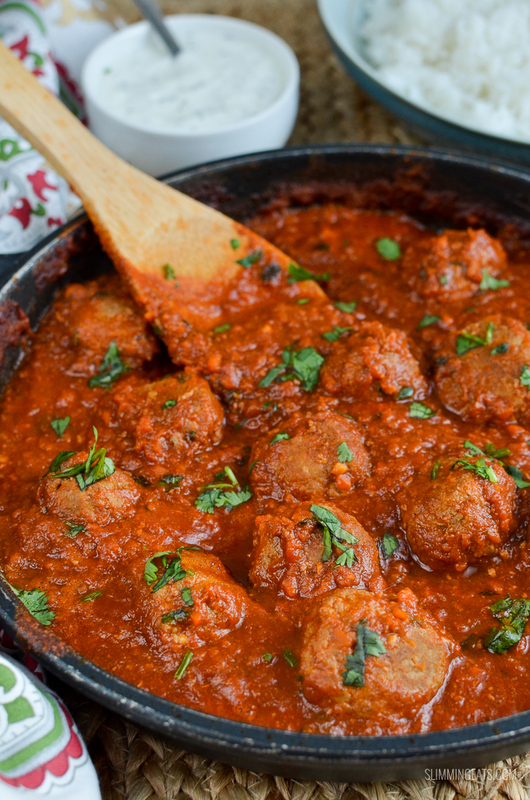 What a fantastic recipe, the meatballs were fantastic-not greasy at all like some meatballs can be and the tomato sauce was gorgeous. Will definitely be making this again! thank you, I think I may have just left the egg sitting there too long on the meat! 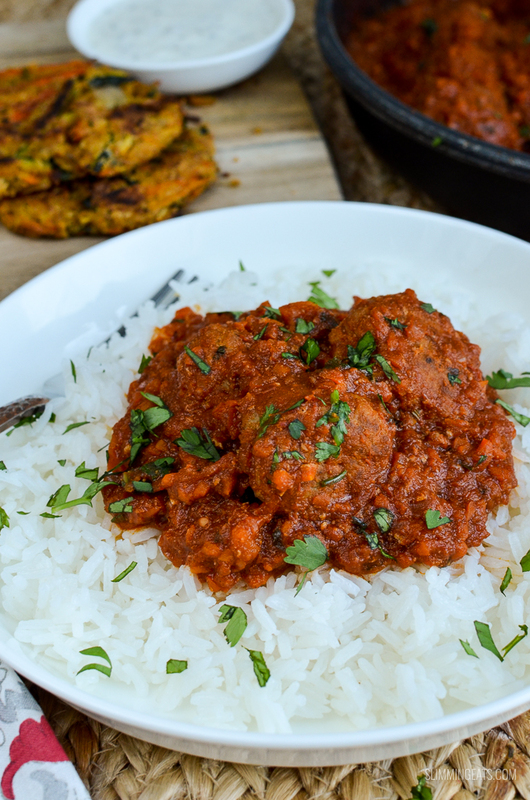 Lamb meatballs are amazing really tasty will def be making again! Made these recently and loved them really tasty can’t wait to make again !